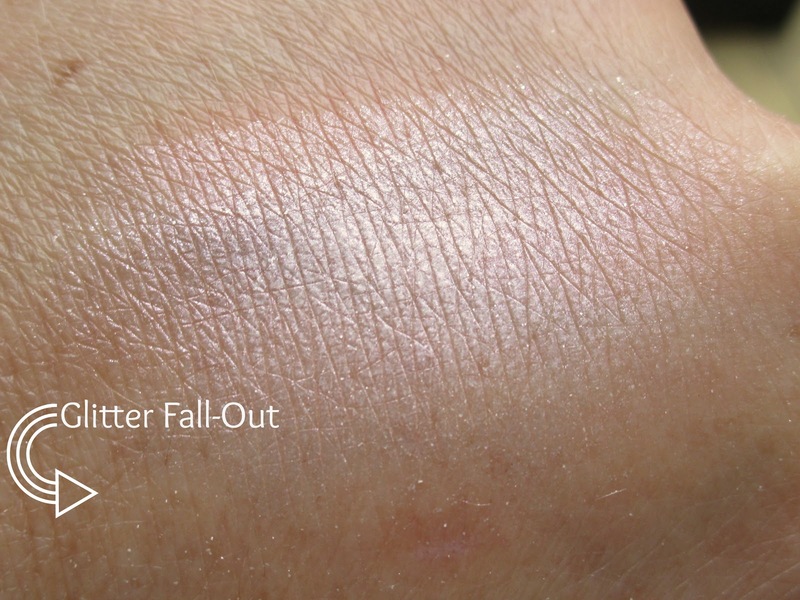 HaySparkle: Revolution Skin Kiss Highlighter in Champagne Kiss - I Don't Like It! Revolution Skin Kiss Highlighter in Champagne Kiss - I Don't Like It! 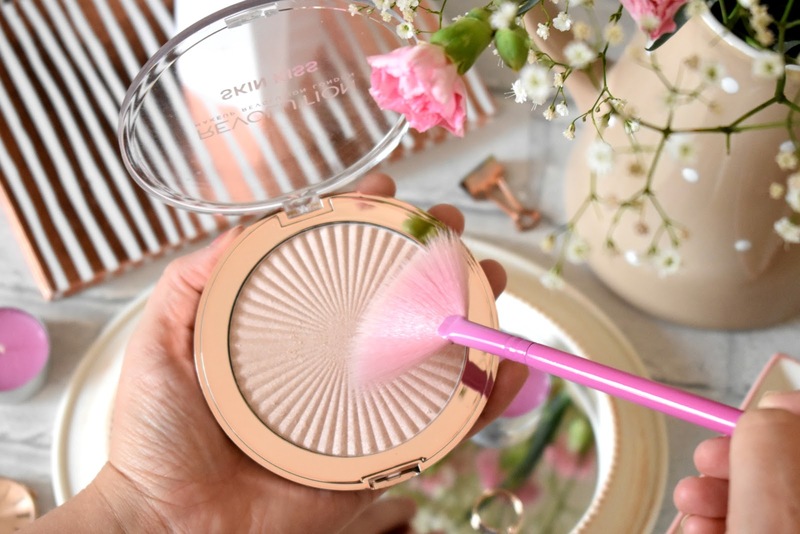 It's no secret that I'm a highlighter addict, in fact I'd bathe in the stuff if I could, so when I saw the Revolution Skin Kiss Highlighter in Champagne Kiss I was like ooohhhh I must try that and here we are! 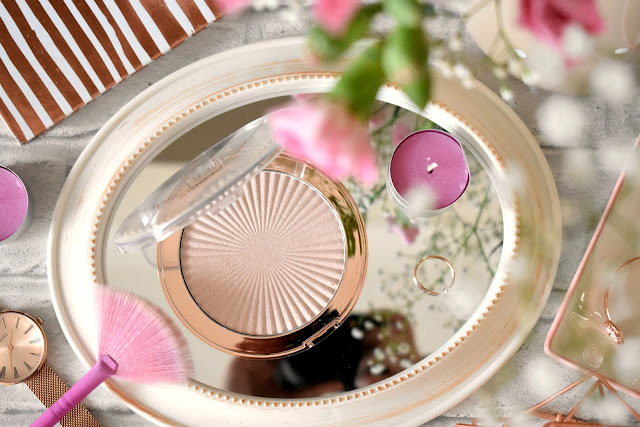 The Revolution Skin Kiss Highlighter comes in a large plastic compact with rose gold accents and a clear lid! For some reason Revolution changed the packaging (I have no idea why), the old packaging was stunning - completely rose gold with a matte finish and a mirror within the lid - I would of much preferred the old packaging if I'm honest but hey, you win some you lose some! Theres quite a lot of shades within the Skin Kiss Highlighter collection but as I said earlier I have the shade Champagne Kiss, this one is a light champagne gold highlighter with a pink duo-chrome shift to it which looks absolutely gorgeous in the pan but unfortunately for me it's crammed full of glitter! Now I don't mind a highlighter with a few subtle glitters and shimmers within it but wow this is full on disco ball, if that's your thing then you'll love this but I much a prefer the more glossy, foil effect of a highlighter than glittery! I also feel like this highlighter swatches much better than when you apply it to your face with a brush, when I swatch Champagne Kiss it does give off that foil effect which I love but on the face it's extremely glittery and the longer I wear it I find my entire face has been taken over by glitter fall out! If you dampen your makeup brush slightly you don't get as much of a glittery effect but you do still get quite a gritty texture, you might be able to see on the swatch below the amount of the glitter particles everywhere if you look closely! 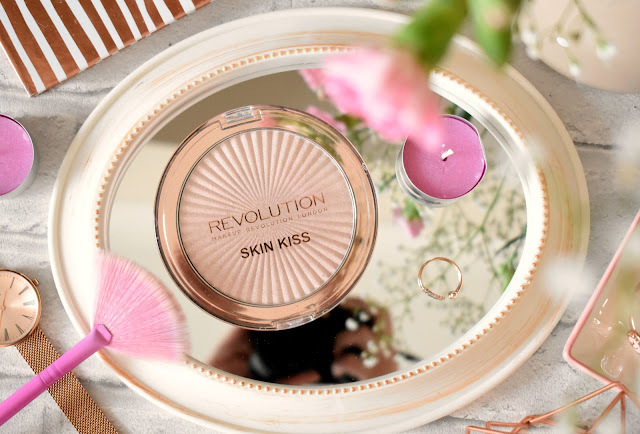 For me the Revolution Skin Kiss Highlighter in Champagne Kiss has been a bit of a let down, it's horrible to say that really because I love Revolution and have loads of their makeup products which I adore but this highlighter just doesn't cut the mustard for me! If your wanting a glittery highlighter for a party or festival this would work really well but for day to day it's to much disco ball and not enough glazed donut for me! You can find the Revolution Skin Kiss Highlighters for £5.00 HERE. Such a shame you don't like it but I know what you mean about the glitter, can definitely see it in your swatch! Looks a bit too much for me as well and I love a highlighter! Oh no, that's really disappointing. I love Makeup Revolution usually too..